Chapter 52 in The Placement Strategy Handbook is entitled “How to Select an Attorney.” Still, we receive many calls from placers ranging from inquiries to insurrection about the way an attorney is handling a case. This doesn’t mean the clients are right. But it does mean the attorney-client relationship has been damaged. I know what you’re thinking. And you may be right. But give him a chance. Leave your office number and an after-hours number. Almost half of those who call either don’t leave a message or say something like, “He has my number.” The best attorneys are always busy. We’re in court, in depositions, meeting with clients and witnesses, or otherwise unable to call back. It’s impossible to memorize or keep a personal list of everyone’s number. A concise message and a call-back number gets your call answered before your lawyer gets into the office and is bombarded by everyone else. There’s a perception that the number of messages somehow relates to the speed of the response. If anything, it slows down the ability to return calls promptly, since the attorney must wade through a message mess. “Urgent” messages are likely to result in an annoyed response, since they’re often returned when the attorney is preoccupied with another matter. Remember, you’re just trying to get your attorney’s attention, not to alienate her. The name of the person who took the message. The date and time the call is returned. We operate on a same-day call-return schedule (no later than the following morning to callers in a later time zone). It can be done, even with dozens of calls. Insist on it. But only if you’ve followed these suggestions. Lawyers live in a world of overreaction. It’s a confrontive, combative, often antagonistic environment that clients rarely see. When you start the conversation with, “I’m honored that you decided to return my call,” or, “Why haven’t you collected my fee?” expect the instincts of a professional fighter to take over. You’ll get attention, but you won’t keep it. Lawyers are trained in logic. They respond to objective, well-reasoned, unemotional statements. If you begin with, “It sounds like you’ve been busy,” or “Is there anything I can do to expedite collection of the fee?” you’ll be encouraging a dialogue, not two monologues. Even the best lawyers are usually truly competent and proficient in only a few areas of the law. Being authorized to practice and being qualified are two different things. Lawyers [like placers] never know where their next fee is coming from. So they tend to accept every case, hoping there’s time to figure it out later. The problem isn’t just that case. It’s the other cases in the office that also won’t receive the attention they deserve. We know that every case is not a winner. An army of marching attorneys can’t help some clients. The key is to be able to focus on the relevant law and facts immediately, so you don’t waste the client’s money and your time. If the attorney isn’t prosecuting your case, this probably wasn’t done. You can help. Maybe it’s a call to a former candidate to find out if he discussed your fee before being hired. Or drafting a demand letter to the employer for your lawyer, so it looks like you spent three hours discussing the facts. Or tracking down the clients one of your ex-recruiters has been contacting. There’s always something you can do to help, even if it’s just communicating with witnesses. I really work with our clients, and they don’t mind it a bit. Just like they don’t mind after-hours calls. Sometimes it’s necessary for you to volunteer. You’ll be surprised how receptive your attorney is to your assistance. Most people who seek the services of a lawyer expect to pay. A responsible client will not start litigation he can’t afford if he knows that you will have to stop work if he doesn’t pay the fee as agreed. But if the fee is a problem, you’re entitled to an explanation. Law is a profession that requires investigation, research, analysis, correspondence, preparation of complicated documents, asking for other professional opinions, evaluation, and waiting for hours in remote courtrooms for hearings that can take minutes. Clients are usually not present. Hourly fees mount fast. I use percentage contingency fees for collections and fixed fees for almost everything else. If your attorney knows the area of law, even fees in trade secrets cases can be predicted accurately. Push for numbers regardless of whether you did at the beginning. Then you should be able to avoid this problem in the future. You don’t have to write the Gettysburg Address. Just confirm the status of the case, fee or whatever else was discussed. State the next step that must be done, who is going to do it, and when it will be completed. Please let me know as further developments arise. Some pretty reliable indications of a busy office are things like assistants frantically running around, others working at computers, phones constantly ringing, filing cabinets with trays full of case files nearby waiting to be filed, and at least a few clients waiting out in the reception room. Other sure signs of success are bottles here and there of Gelusil or Mylanta on the partners’ desks. If they are near empty, so much the better. Of course, if you see an oxygen tank over in the corner, that should be a clincher. We could philosophize about the attorney being responsible to notify a client about the status of cases. But that’s like holding a recruiter responsible to notify a client about the status of searches. The more attentive ones do it, but they’re not necessarily the more successful ones. So don’t stand on ceremony. Unless of course it’s the raising of the flag. For sure, successful lawyers (like successful recruiters) have strong egos. The idea that a client would consider going to someone else is impossible for them to accept. So even though it’s a killer, it’s a sure-fire attention-getter. In fact, it’s so reliable that if the attorney doesn’t respond, you’re probably better off with another. While you can dismiss an attorney whenever you choose, this is obviously the last resort. Time and money can be lost in the transfer, and many lawyers refuse to accept cases that have been handled by others. Doing nothing to prosecute or defend the case. Failing to give competent advice to the client. Dealing dishonestly with the client or an adversary. If money is due, an attorney’s lien may be placed on funds or documents until it is paid. Tell your lawyer directly and give your reasons. Send your lawyer a letter of dismissal and retain a copy. Arrange to pay any outstanding charges. Pick up the file as soon as possible. Of course, there are always bar association complaints, malpractice claims and civil lawsuits. But most clients just want the negativism and disruption out of their lives. Litigation is a slow, complicated, unpredictable, expensive process. To the extent your lawyer can expedite, simplify, win, and reduce the fees, he’s the one for you. I hope you don’t need to get the attention of your attorney. But if you do, this should help. 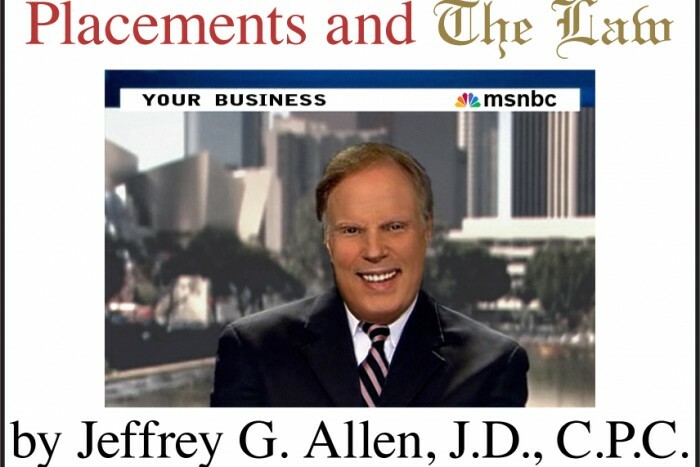 More than thirty-five years ago, Jeffrey G. Allen, J.D., C.P.C. turned a decade of recruiting and human resources management into the legal specialty of placement law. Since 1975, Jeff has collected more placement fees, litigated more trade secrets cases, and assisted more placement practitioners than anyone else. From individuals to multinational corporations in every phase of staffing, his name is synonymous with competent legal representation. Jeff holds four certifications in placement and is the author of 24 popular books in the career field, including bestsellers How to Turn an Interview into a Job, The Complete Q&A Job Interview Book and the revolutionary Instant Interviews. As the world?s leading placement lawyer, Jeff?s experience includes: Thirty-five years of law practice specializing in representation of staffing businesses and practitioners; Author of ?The Allen Law?--the only placement information trade secrets law in the United States; Expert witness on employment and placement matters; Recruiter and staffing service office manager; Human resources manager for major employers; Certified Personnel Consultant, Certified Placement Counselor, Certified Employment Specialist and Certified Search Specialist designations; Cofounder of the national Certified Search Specialist program; Special Advisor to the American Employment Association; General Counsel to the California Association of Personnel Consultants (honorary lifetime membership conferred); Founder and Director of the National Placement Law Center; Recipient of the Staffing Industry Lifetime Achievement Award; Advisor to national, regional and state trade associations on legal, ethics and legislative matters; Author of The Placement Strategy Handbook, Placement Management, The National Placement Law Center Fee Collection Guide and The Best of Jeff Allen, published by Search Research Institute exclusively for the staffing industry; and Producer of the EMPLAW Audio Series on employment law matters. Email him at jeff@placementlaw.com.